EN Enormous wealth — the unique Items of archeologlcal collections, relics of D sack, the collection of paintings, personal things and archives are kept in the museum of Rostov region. 1. 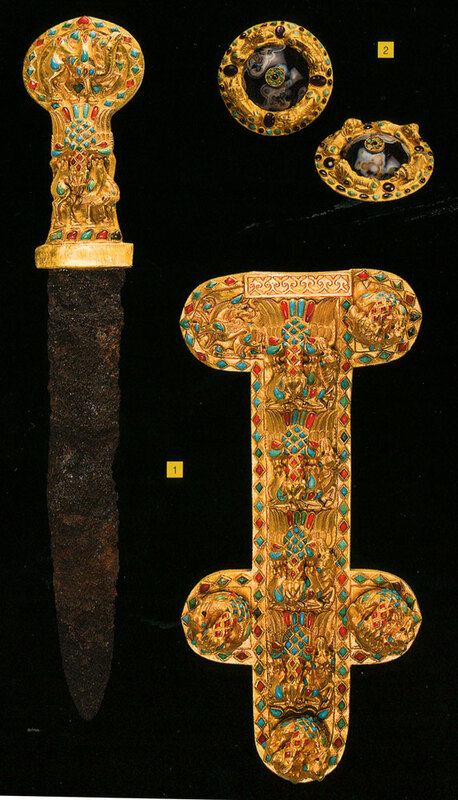 Sword with sheath (gold, turquoise, cornelian, iron). 2. Falars (gold, bronze, turquoise, agate, alrnandine, glass, coral, garnet). 1-2: Last quarter of I century В. C. Kurgan barrow “Dachi”, Azov. Excavations of E. I. Bespaliy, 1986. Azov historical-archeological and paleon tological museum-preserve. 3. Kalaf — women headgear. Scientific reconstruction of TA. 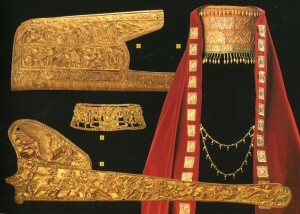 Skripnik (gold, textile). 4. Upholstery of Gorite — quiver for bows and arrows (gold). 5. Upholstery of Akinak sheathe, Skythian sword (gold). 3-5: IV с. В. C. Elizavetinskaya stanitsa. Barrow group “Five broth ers”. Excavations of VP Shilov, 1958. 6. Grivna (women necklace), end of I c- beg. of II c. B.C. (gold, turquoise). Kobyakovo barrow, Rostov-on-Don. Excavations of TA. Prokhorova 1987. 3-6: Rostov regional museum of local lore. DE Reiche Schätze — Seltenheiten aus archäologischen Sammlungen, Reliquien des Don-Kosakentums, Gemäldesammlungen, Privatsachen und Archive — werden in den Museen des Gebiets Rostow sorgsam aufbewahrt. 1. Schwert mit Scheide (Gold, Türkis, Sarder, Eisen). 2. Falary (Gold. Bronze, Türkis. Achat, AI mandin, Glas. Koralle, Granat). 3. Kalaf — Frauenkopfbedeckung. Wissenschaftliche Rekonstruktion von TA. Skripnik (Gold Stoff). 4. Bezug des Gorites, des Bogen- und Pfeilkoffers (Gold). 5. Bezug der Scheide für einen Akinak, ein Skythenschwert (Gold). 3-5: das 4. Jh. v.u.Z. Die Kosakensiedlung Elisawetinskaja Die Hügelgruppe „Pjat bratjew”. Ausgrabungen von W.P Schilow. 1958. 2. Jh. v.u.Z. (Gold, Türkis). Kobjakowskij Grabhьgel, Rostow am Don. Aus grabungen von TA. Prochorowa, 1987. Saber of emperor Alexander IStele at the entrance of ancient Tanais with image on pediment of goddess Tikhe — the guardian of city gates. Middle of III century B. C.